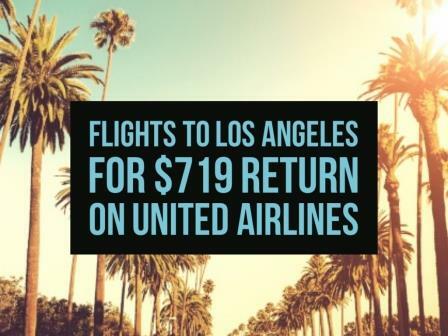 United is having a sale on flights to Los Angeles. Travel in Oct – Dec.
Melbourne to Los Angeles Flights $719 Return using Visa Debit Card. $733 using CC. Sydney to Los Angeles Flights $736 Return using Visa Debit Card. $750 using CC. Brisbane to Los Angeles Flights $742 Return using Visa Credit Card. $742 using CC. Adelaide to Los Angeles Flights $839 Return using Visa Debit Card. $855 using CC. Hobart to Los Angeles Flights $841 Return using Visa Debit Card. $857 using CC.